One of the great wearers of the black and gold - indeed she wore the club's colours in more games than anyone else - may, on Saturday, win the most famous colours of all. Nikki has already played for the 1st XV, and if she gets onto the field on Saturday afternoon she will win her "Blue" in her very first year - a remarkable performance. Many of you will remember Simon Hill, former coach of the girls, who returned to New Zealand a couple of years ago and now lives in Christchurch, scene of last week's massive earthquake. Fortunately the news is that Simon and his family are okay, but more than that Simon is not sitting back just thinking about his own problems. Yesterday he organised an afternoon of rugby for his community at a local park - Parklands Reserve - which seems to be about the size of Legends Lane (if rather flatter!). Incredibly 1500 people turned up! So Simon is going to organise another event, at a similar venue a couple of miles away, tomorrow. What is is achieving? Well, as he says "the smiles on those kids faces will keep you going for the week - trust me"
Eleventh chapter of the summary of the history of women's rugby in France, from the book "Rugger Girls"("Des Filles en Ovalie"), written by Jacques B. Corti and Yaneth Pinilla Foreword by Serge Betsen. Published weekly(ish) by French women's rugby blog Des Filles en Ovalie. 1986 was a year of great celebration. French women's rugby celebrated 20 years since the formation of the Violets of Bressan. 120 players took part in an anniversary event that was coupled with the General Assembly of the FFR. Only one shadow of concern disturbs this idyllic picture: Henry Fléchon (the guiding force for most of the two decades) has fallen seriously ill. The newsletter continues to develop and include big news. The "Beyond Borders" section, which covers initiatives from other countries, tells how participation is increasing elsewhere: "As far as national women's federations, France is no longer alone with Holland! The Italian women have formed a league! The British too! " On the strictly national teams, potential adversaries are also becoming much more numerous. "Competition is growing internationally with the creation of teams from Sweden, Spain, U.S., and Germany." It was also during 1986 that there is a small but significant change to the national team's badge. The acronym "AFRF" disappears, being replaced with that of the FFR*, who had taken over the running of women's rugby a couple of years before. Its design, however, does not change: a rose on white background surrounded by red and blue. Extract from the book "Des Filles en Ovalie", Editions Atlantica (2005), Written by Jacques Corte / Yaneth Pinilla B. Foreword by Serge Betsen. *Note that it would be more than 20 years later before women's teams from England would wear the badge of the RFU! Sky's live coverage was slightly spoilt by their decision to switch the game to the "red button" in the second half in favour of some utterly forgettable golf event. I guess we should be thankful that they covered it at all, but even so this was a bit shabby - especially for anyone following the game online (as a fair few were) or trying to record it. Sky have a "feedback" page at http://www.skysports.com/contactus/, if you can spare a minute (and whether you were watching it or not - indeed whether you are a Sky subscriber or not) please drop them a line and tell them what you think about this! Elsewhere Ireland predictably beat Scotland - by only by 22-5, which - considering the hiding Wales gave them a fortnight ago - was perhaps not a great performance. Especially as Wales lost 12-8 to Italy today, which mean that the Italians will be targeting fourth place this year - which will be a remarkable performance. PS - Congratulations to England U20s as well, who beat France 12-5 before the women's game. It is only round three of the Six Nations this weekend, but it is still the weekend that will decide whether England will win their six successive Six Nations, or France will win for the first time since 2005. But first up on Saturday Scotland take on Ireland at Lasswade, desperate to avoid another humiliating defeat. Unfortunately Ireland have won the last five meetings between the teams, each by a large margin than the last, and there seems little or no sign this will change - especially with Scotland missing Caroline Collie, the one new player who has been a real "find" for them this season. Last time they met in Scotland, Ireland won 23-0 while the last meeting between the two sides was a 32-8 win for the Irish. Expect the scoreline to be at least as big again. On Sunday Wales travel to Italy for a tricky fixture, hoping to reverse the home defeat they suffered last season, and given two confidence boosting performances they should. Which leaves is with Engla v France, line on Sky from 1pm. England should win this (they are practically unbeaten at home - but it should be a fascinating battle. 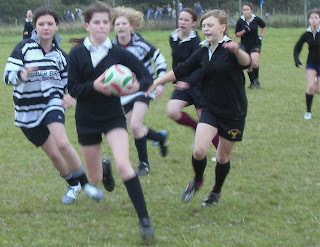 The next fixture for the Letchworth U15 girls team will be a home encounter with Hertford RFC on Sunday, 6th March. Kick off times, etc. will be announced next week. It's that time of year when we can start to look forward to a few more daylight hours, a bit more warmth around, the first flowers of spring bursting into bloom and, of course, the knowledge that the annual round of rugby tournaments will shortly be upon us! Letchworth Girls manager, Dave Rae, informs us that the first tournament this year for Letchworth Girls will be at Newmarket RUFC on Sunday, 20th March followed by the Gloucestershire 10s tournament at Hartpury College on Saturday, 23rd April. The Newmarket RUFC have only recently formed girls teams at both U15s and U18s and this is the first running of the Newmarket Festival which should provide a great days competition. The Gloucestershire 10s is the latest incarnation of a girls' rugby tournament at Hartpury College which has been very successful over recent years. The organiser of this year's event is none other than Joe Randall - Letchworth Girls head coach in 2006-7 - and promises to be a really great tournament. Coming soon to a school and club near you? Tag plus. Several south-eastern counties are currently being treated as a testing ground for new forms of mini- and junior rugby for U13s, the main feature of which is to delay the introduction of full contact rugby until possibly as late as U13 (School Year 7 or 8), whereas at present contact rugby in the minis starts around U8s or U9s. Though these initiatives will be very unpopular with coaches and boys already playing mini rugby, in practice it will probably not make any real difference to girls rugby. Though many girls do play rugby from the age of 6 or 7, their small numbers compared with the boys - and the lack of advice to coaches or any official initiatives to keep them playing - means that many (most?) drop out by the time they are 9 or 10. Indeed, it may help girls (and, come to that, boys) take the game up in Years 6 or 7 as, at the moment, any 10- or 11-year olds wanting to join a mini-rugby team have a huge mountain to climb. As part of this England players Amy Turner and Rachael Burford (in their role as RFU's Community Rugby Coaches) have been delivering a transition game called Tag+ for year groups 7 and 8 across Kent, Surrey and Sussex. It has the same rules as Tag but includes uncontested lineouts and scrums to restart the game. Apparently (according to the RFU) schools have seen the girls, parents and staff discover that rugby is an "engaging, inclusive and enjoyable game". Tenth chapter of the summary of the history of women's rugby in France, from the book "Rugger Girls"("Des Filles en Ovalie"), written by Jacques B. Corti and Yaneth Pinilla Foreword by Serge Betsen. Published weekly(ish) by French women's rugby blog Des Filles en Ovalie. North/Ile de France, with Chartres, Soisy, Chilly, Tourcoing, Stains, Villeneuve-la-Garenne. Centre/South West, with : La Teste, Tulle, Romagnat, Montluçon, Tours, Niort. South East/ Bourgogne/ Lyonnais, with : Bourg, Le Creusot, Chatenoy-Le-Royal, Ecully, Rillieux, Tournus. South, with : Bézier, Saint-Laurent-de-la-Salanque, Carqueiranne, Toulouse, Narbonne, Villefranche-de-Lauragais, Port-la-Nouvelle. What all these developments it needs to be remembered women's rugby was so organised that from the spring of 1984 it does not have a break. That year, from August 5 to 13, a training camp takes place at Gruissan, so even in the summer the girls had live rugby! After a scorching summer of rugby, official activity accelerated. In 1985, Wanda Noury was elected Vice-Chair of the Steering Committee, responsible for the North. Claude Izoard worked with the sports commission, Marie-Celine Bernard and Jackie Leterre dealt with licensing and discipline, and Viviane Berodia was elected to the secretariat. This was also the moment that the Ministry of Education and the FFR took further action recognising women in rugby. An official three-day course, organised at INSEP (the French National Sports Institute), by Michel Debet and Jean-Claude Bacqué, on "Problems of teaching rugby in schools and liaising with the clubs" is delivered by two lecturers, one of whom was Marie-Celine Bernard. 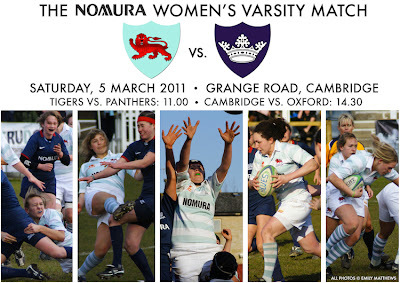 Live women's rugby - on the BBC! Great news that England's game at Twickenham against Scotland on 13th March will be shown live on BBC TV, via the Red Button. Its actually quite strange that there has been any doubt about this (and the BBC still does not seem to have been an official announcement), being as the last time England played a Six Nations game at Twickenham (in 2007 against Italy) that was shown - so not showing the game would have been an odd decision. On the other hand, there is a the risk is that this particular game could be quite embarrassing. Scotland have lost all of their last three games by record margins and will not - unless there is an astonishing improvement in performance - provide much opposition. England rattling up 70 points or more (which is highly probable - they scored 72 in 2009 against a stronger Scotland team) would not be a great advert for the game for new viewers, while anything over 90 or so (quite feasible) might almost risk making better coverage in the future less likely, as broadcasters will not be very keen on showing one-sided contests. Information about the new Divisional Squads remains somewhat thin on the ground of late, but at last something has emerged. Last weekend the senior divisional teams played their first games, and with ex-Legend Sasha Acheson - now of Hertfordshire, Saracens, UWI Cardiff (and anyone else whose shirt she can borrow, no doubt - no change there!) - in the starting XV at prop, London & South East won their inaugural match against the South West at Newbury last Sunday (February 13) by 15-5 with tries by Natalie McClarnon, Tina Lee and Hannah Gallagher. The U18s - with five Herts players in the 22 - kick off their season against the South West this weekend, while the U15s (with Syd, hopefully) will play against the same opposition on 13th March. However, as is the way of things, the Divisional programme seems to have undergone some changes in recent weeks, with both the U15s and U18s now building toward a festival at Hartpury on 16/17 April (rather than just the U15s, and in May). Also the latest fixture list doesn't seem to include any games for any North or Midlands U15 teams, but that may just be an oversight. Women's sevens at its best? Does raise the question - again - about why we can't get similar film of international women's rugby matches played on this side of the Atlantic (apart from the odd two minute highlights package). Ninth chapter of the summary of the history of women's rugby, from the book "Rugger Girls"("Des Filles en Ovalie"), written by Jacques B. Corti and Yaneth Pinilla Foreword by Serge Betsen. Published weekly(ish) by French women's rugby blog Des Filles en Ovalie. At the 1982 AFRF General Assembly, Nadine Leterre, who had elected two years before by Tulle Women, proposed to implement an idea that had been in the air for several seasons: the creation of the French national team. And this time the dream did not remain in draft - just weeks later the first international match took place. On June 3, 1982, in Utrecht, Holland hosted France. The little French, led by Jackie Leterre and Claude Izoard, won 0-4. "From the beginning we had an rough plan. We needed to be familiar with the women and girls playing rugby. And they wanted to know how to develop their game technically," said Jacky Laterre, more than twenty years later. "We worked in closely with the club coaches," remembers Claude Izoard, "trying to find a central place that girls could make, travelling as few kilometers as possible." The international games continued. In May 27 1984 in Hilversum the Netherlands defeated France 0-3, but for this game there was a small novelty: the girls got a navy blue tracksuit and shirts which they decided to decorate, sewing on a badge. That of AFRF (not FFR!). The following year the first meeting took place against the English*. In Richmond, the French maintained their dominance in Europe by beating the first women's representatives of Perfidious Albion 8 to 14. *NOTE: Actually, Des Filles en Ovalie is a little incorrect here. The game took place 19th April 1986 (not 1985), and the team France played in Richmond was Great Britain (you can read a match report here). England would not play their first international until 1987, and did not meet France until the semi-final of the first World Cup in 1991. France have released video from their game against Ireland, but that seems to be the only film available from any of last weekend's games. There were cameras at England v Italy, but the video does not seem to have been released by RFU, while Scotland's latest defeat to Wales also seems to have been unrecorded on film (well, that or it has fallen foul of the censors - a minimum 18 rating north of the border). However, some... unusual... highlights of the previous round's game between Italy and Ireland are also now available. Not sure what the editorial team were thinking in this case - its more like a film trailer! In the next round we do at least know that England v France will be fully covered, but of the other games... who knows? * RFU may not have published highlights from the England v Italy game, but fortunately ScrumQueens have obtained a copy. And, moreover, its the already multi-honoured 2006-7 team! Basically the above image, taken by Mike Alcock, has been judged the winner of a photo competition called "Love the Mud", sponsored by Seakskinz - a manufacturer of waterproof sports socks. For those that remember it, the spring of 2007 was a classic period for mud-soaked rugby fields, never better than the memorable day at Lichfield RFC when National 10s was decided by means of a 100m freestyle relay. Okay, I exaggerate... but not by much. Drowning did become a real possibility when anyone dived for a try, or ended at the bottom of a ruck. Even so, it did represent a high water mark for the team who never threw in the towel as they broke their duck in final lengths of a national competition (well, finished 5th anyway), and its also perhaps no co-incidence that the team mascot for the next couple of seasons was, in fact, a duck! Anyway - well done to Mike. Not to mention Rosie, Nim, Emily, Laura, Charlie and (I think) Nichola. You were stars! European Sevens 2011: England draw the champions? More news about the the 2011 European Sevens has emerged. Apparently this awaits some final confirmation, but it seems the plan is that the main division will be 12 nations - the "Top 12" - which will still be a single event this year, and will be played alongside the men's tournament which is likely to be in Bucharest on July 16/17. The seeding is interesting, confirming as it does the non-entry of Scotland and Ireland, which also presumably means that they will also not be entering the 2013 Sevens World Cup (and so not the Olympics as well?). Group A looks very tasty indeed... England, champions Spain, Wales (whose record against England at sevens is pretty good, if short), Italy (much more dangerous in this format), plus Sweden and Germany (Sweden v Germany always has a certain something!). Group B... rather more predictable. None of this is officially official yet, but its pretty close. Kelly Van Hartskamp (NED). Player of the tournament (IMHO). A fantastic final in Las Vegas rounded off a remarkable weekend of international women's rugby. Tyrolian Select win the "Spirit of the Las Vegas International"
It’s a really physical game now, but after some memorable exchanges it’s the Dutch who break the deadlock – Pien Selbeck in at the corner. No conversion this time, so 12-12. And so it remains until – with seconds on the clock – Canada steal a Dutch lineout, Magili Harvey cuts inside… and scores! Conversion missed, but Canada do not care. The whistle goes, and Canada are the USA Sevens Champions! In the third place game, its just as exciting. Spain go into the break 12-7 ahead, but France gradually whittle down the lead as the long weekend begins to wear the Spanish down. A penalty finally gives France the lead 15-12 entering the final minute. Spain break away with seconds to go - but the run is stop with yards to from the line. A desperate grubber kick, but France win the race to the ball, kick it into touch - and the whistle goes. France take third, and European Champions Spain must be content with fourth. And next month they do it all again, at the Hong Kong Sevens. Well, maybe an exaggeration and - when you only have Tweets to follow the game - maybe even a shade misleading, but even so Wales - not, let's face it, the strongest side in the Six Nations at the moment - rather blew Scotland away - and in Scotland as well. Wales had scored five tries, and were 36-0 up, and had brought on most of their replacements, before Scotland scored. Another try late on, and the kicking of Caroline Collie, avoided complete embarrassment, but a 12-41 defeat is still easily their worst ever performance against Wales and their sixth consecutive defeat in a fixture which they used to dominate. No Six Nations next week, but in two weeks time its the big one - England v France - as well as Scotland v Ireland, and Italy v Wales. Live women's international sevens rugby - ON NOW! 6 Nations: You've got to see this!